» Help Protect the Visual Environment of Los Angeles! Help Protect the Visual Environment of Los Angeles! Monitoring applications for sign districts, sign programs, and projects that include signage and billboards. 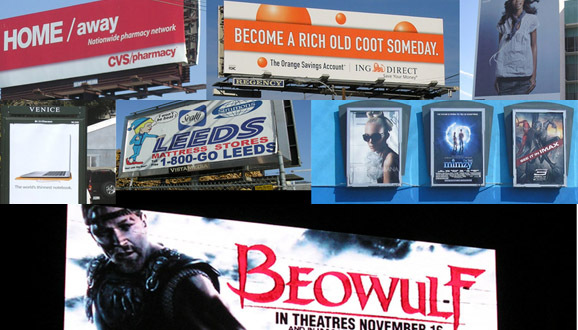 Responding to environmental documents prepared for planned projects that include billboards and other signage, such as NBC/Universal, LAX, Farmer’s Field/Convention Center, and Wilshire Grand. Sending Action Alerts to mobilize public opinion and organizing testimony and public meetings and hearings on billboard and signage legislation. Documenting violations of billboard and sign regulations and pushing city agencies for enforcement action. Providing media interviews to keep billboard issues in the public eye. Taking legal action when necessary to uphold laws and regulations. Pushing for a moratorium on the digital billboards that appeared in neighborhoods without any public notice or hearings. Our efforts helped lead to the City Council approving that moratorium and then a permanent ban on any more of those signs, which is now being threatened by the billboard industry’s aggressive actions. Organizing a citizen’s inventory of billboards in Council District 11, to spotlight the fact that the city had failed to initiate a formal inventory and inspection program that had been approved six years earlier. The Coalition then provided help to people in other council districts who conducted their own surveys, which prompted the city to finally start the long-stalled program. This inventory was just released to the public and is available at the Department of Building and Safety’s website. Joining three homeowners’ associations in challenging the permits issued to three digital billboards in the Westwood area on the grounds that they violated neighborhood zoning regulations. After those challenges were upheld by the area planning commission, Clear Channel and CBS Outdoor sued to overturn the decision. The Coalition retained legal counsel to support the city and make the public’s voice heard in the courts. Mobilizing public opinion against a proposal to place advertising signs in public parks and recreation facilities. After the Coalition helped organize appearances at meetings and a letter-writing campaign, the Recreation and Parks Commission indefinitely postponed further discussion of the proposal. Aiding the City Attorney’s successful crackdown on illegal supergraphics by locating and documenting a large number of those signs. Please make a donation to the Coalition to Ban Billboard Blight today. Your generosity will have a direct impact on our city’s visual environment.